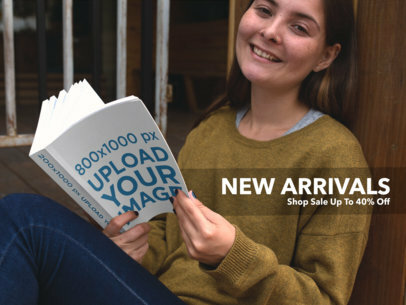 Display your awesome mockup of a young girl holding a book on her hand while she's lying down on her bed. Start now! 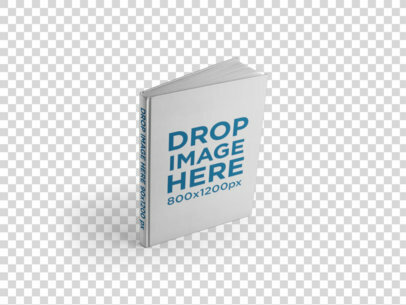 All you have to do is drag-and-drop your book cover image on the interface, we will merge it for you. Make your income grow with Placeit. Try another Book Mockup here! Got a new book ready to be launched into the marketplace, but can't seem to come up with the right marketing strategy to do it? Don't stress and check out Placeit's book mock-ups to solve your marketing problems within no time! This e-book mockup featuring a book standing on a shelf at a bookstore could be precisely what you need, so don't think about it twice and customize it right away! See more eBook Cover Templates here! 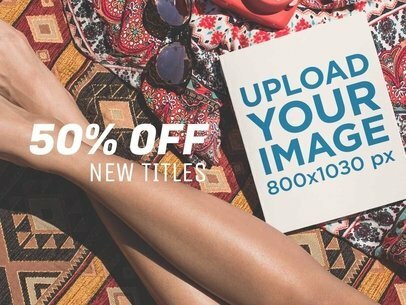 Take a look at this gorgeous visual featuring a book lying near a girl at the beach, you can edit this image to promote your latest design for a book in a beautiful and photorealistic way through social media ads. Start now! The menu on the right side of the page will let you choose a color for the book and will let you customize the text box. Then upload your design and edit the text with the menu on the left. Try another Facebook Ad! 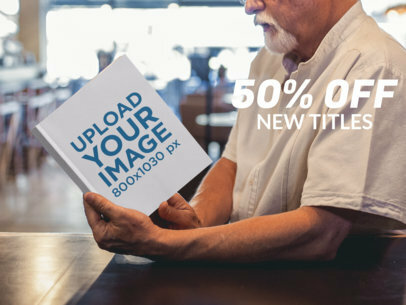 Have a glance at Placeit's new eBook mockups, this image will help you create your own customized photorealistic visual to promote your book through Facebook Ads! Use the menu on the right side of the page to choose the badge, change its color and choose the book color. Then drag-and-drop your jpeg or png image file over the upload button on the left side of the page. Don't forget to edit the texts too! Try another eBook Ad! Take a look at this gorgeous ebook ad maker by Placeit! You can now promote your latest design for a hardcover book in a really simple and beautiful way, make your ads convert with Placeit! The menu on the right side of the page will let you choose the book and background color, then upload your cover and spine design with the menu on the left. Don't forget to edit the text, you can choose each line's color and font, and even remove one! Try another eBook Ad! 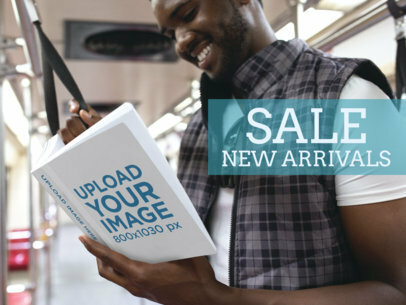 Take a look at this gorgeous visual featuring a smiling black man reading a book while at the metro, it's a beautiful visual that you can use to promote your latest design for a book in a photorealistic and visually appealing way! Use it now, the menu on the left will let you upload your designs for the spine and for the cover, then edit each line of text color and font, or even remove them. Try another eBook Ad! Looking for a way to showcase your latest design for a book through Facebook Ads, Instagram Ads or even Twitter Ads? Use Placeit! This gorgeous image will let you promote your latest design in a beautiful and photorealistic way, use the menu on the right to choose the book color and to customize the text frame, choose the type and its color! Then edit the text and upload your design image with the menu to the left. Try another eBook Ad here! 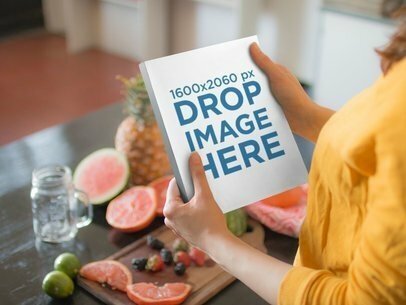 Promote your book with this awesome mockup of a woman holding a book while at the kitchen, there are ingredients to cook in her counter. It's an awesome choice if you are looking to promote your cooking book in a creative and beautiful way! 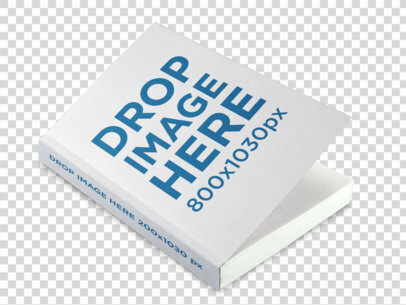 Drag n' drop an image file of your book cover over the interface, it'll be merged with the book in just seconds. Try another Book Mockup here! Have a look at this gorgeous visual featuring a senior man holding a square book while drinking a tea inside his house, you can promote your latest design for your square book with it through Facebook Ads, Instagram Ads or even Twitter Ads in a beautiful and photorealistic way! Start now, use the menu on the right to customize the badge color and type and to choose the book color. Then upload your design using the upload button on the left. Try another eBook Ad! Looking for a unique and beautiful way to promote your latest kitchen or recipes book? Use Placeit! 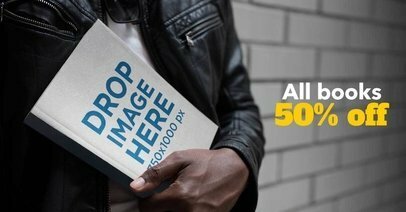 This gorgeous visual asset will let you not only showcase your book design in a photorealistic way, but also put text on the image to promote your designs through Facebook Ads! Use the menu on the left to upload a design for the cover and for the spine, then edit each line of text font and color, or remove one of them! Use Placeit and make those Ads convert! Try another Facebook Ads! Take a look at this gorgeous eBook Ads mockup from Placeit, it's a beautiful visual that you can use to promote your latest design for a paperback book in a beautiful and photorealistic way. Start using it now, use the menu on the right to choose the book color, then upload your design with the upload button on the left. Don't forget to edit the text, you can choose each line's color and font and even remove one of them! Try another eBook Ad here! Take a look at this gorgeous visual featuring a girl reading a book, it's a beautiful visual that you can use if you are looking to promote your latest book through Facebook Ads in a photorealistic and beautiful way. Start now! The menu on the right will let you choose a color for the book and a type of frame for the text. Then edit the text and upload a spine and cover design using the menu on the left. Easy, right? Try another Facebook Ad! Take a look at this gorgeous Facebook Ad generator by Placeit, it's featuring a book being read on a wooden table by a man. You can customize this image to promote your own book content in a beautiful and photorealistic way! 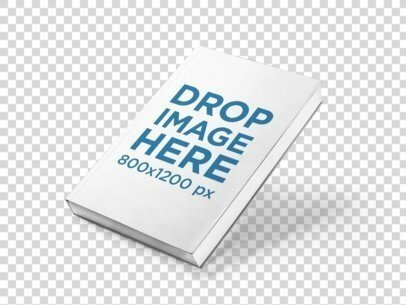 Use the HEX tool on the right side of the page to choose the book page's color, then drag-and-drop your jpeg or png image file over the upload button on the left. Don't forget to edit the text too! Try another Facebook Ad! Start promoting your latest book in a beautiful and innovative way through Facebook Ads, use Placeit! 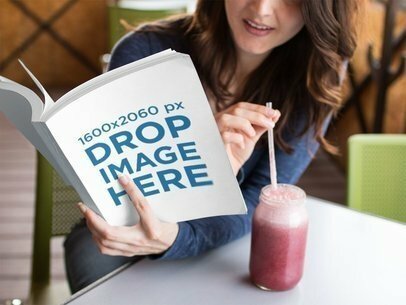 This awesome mockup features a slightly open book lying on a solid color surface, you can edit the image to match with your design. Choose the background color with the menu on the right side of the page, then edit the text and choose each line's color and font using the menu on the left. Don't forget to upload your cover design and spine design using the upload buttons! Try another Facebook Ad! Use Placeit now and promote your latest book cover in a better way! You just have to choose a color for the book and for the background using the menu on the right, then use the menu on the left to edit each line of text and to upload your book cover design and your book spine design to this mockup. After a moment you will see the processed image. Great, right? Try another eBook Ad Mockup! 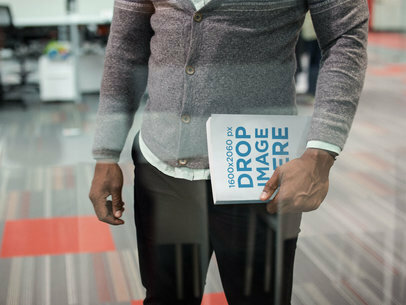 Showcase your awesome book with this mockup of a black man holding a book while standing in the other side of the window, it's an excellent option for you to showcase your book cover in a creative and professional way. Start now! All you have to do is drag-and-drop your image file on the interface, we will process it in just seconds. Try another Book Mockup here! Stop looking for print mockups, the perfect book mockup is right here! Customize it now by adding your image over the mockup template, our mockup generator will create a download for you in just seconds. 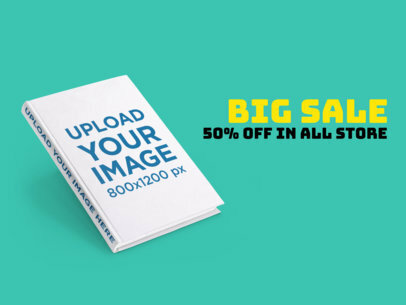 It's super easy to make your own photorealistic mockups thanks to our mockup tool, start promoting your products with this ebook mockup held by an urban young man. To see another Book Mockup click here! 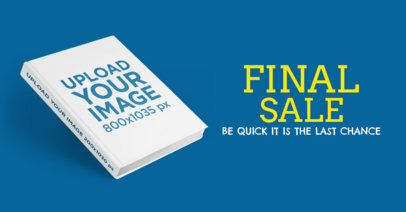 Check out this incredible Ebook Mockups Guide! Start promoting your latest book in a more effective way through Facebook Ads, Instagram Ads or Twitter Ads, use Placeit! 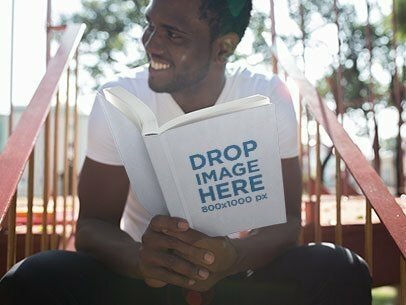 This awesome mockup will let you edit your own image by uploading your design to the book and adding text to the image in a really simple way. Start now, use the menu on the left side of the page to edit each line of text, you can change their colors and fonts, and even remove them! 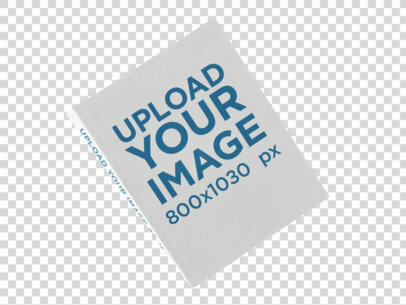 Use the upload button to upload your design, we will merge it with the book in just seconds. Try another Facebook Ad! 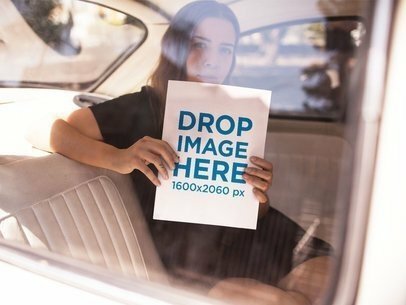 Check out this awesome mockup of a girl holding a big book while inside a car, it's a great option if you are looking to promote your latest book! 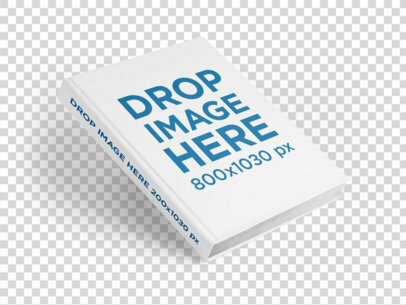 Just drag-and-drop your book cover image on the interface, we will merge it for you! Using powerful visuals will make your income grow. Try another Book Mockup here! 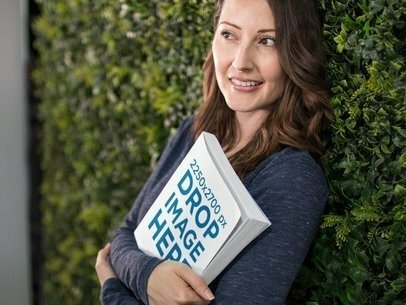 Check out this awesome mockup of a pretty woman happily holding a book while lying against a wall covered with plants, it's a great option for you to showcase your latest book in a creative and professional way. High-quality images are a must to accomplish a better engagement with your audience. Get started! 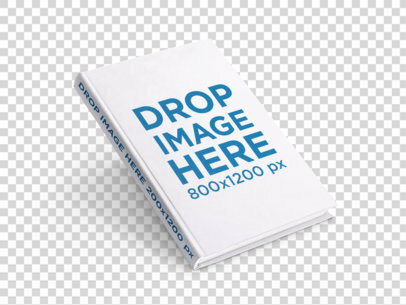 You just have to drag-and-drop your book cover image on the interface, we will merge it in just seconds. Try another Book Mockup here! 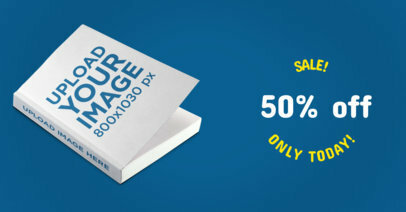 Check out this awesome mockup, it's everything you need to start making more money selling your book. All you have to do is drag-and-drop your image file on the interface, it'll be automatically processed by Placeit. That's right, after just a few seconds you'll see the processed image on your screen. It's featuring a hispanic woman reading a book while drinking a strawberry smoothie, start now and make your income grow! Try another Book Mockup here! Start promoting your latest book cover in a beautiful and photorealistic way, Placeit has an excellent choice for you to do that. Start now, the menu on the left side of the page will let you upload your book cover image file, just use the upload button. Then edit the text with the options above, you can remove each line of text, change its font and color! What an awesome tool, right? Try another Facebook Ad! 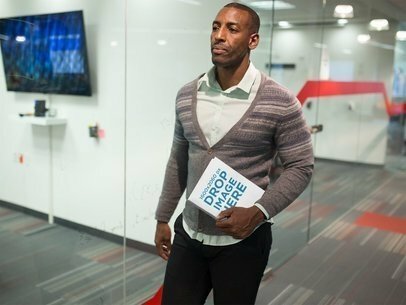 This mockup of a black man holding a book while walking through an office is an excellent option if you are looking to showcase your latest book in a professional and beautiful way. High-quality visual assets are a very powerful tool that will help you get to a broader audience. Start now! Just drag-and-drop your image design on the interface, we will merge it for you in just seconds. Try another Book Mockup here! Check out this awesome mockup of a paperback book lying on a transparent surface, it's a really cool visual that'll help you build a stronger image marketing! 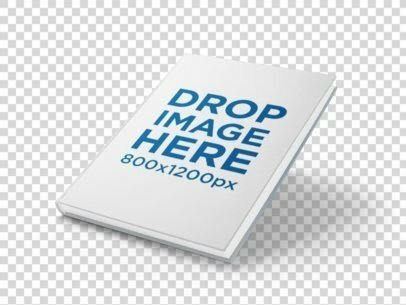 All you have to do is upload a jpeg or png image for the cover and another for the spine, by using the menu on the left side of this page. Easy, right? Try another Book Mockup here! 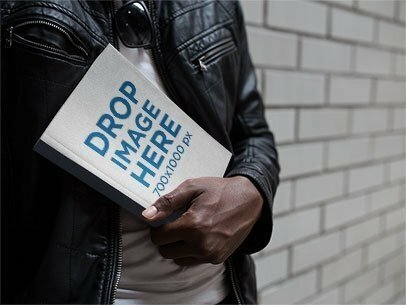 Take a look at this mockup of a book floating over a transparent background, it's a gorgeous visual that will help you build a much stronger image marketing! Just upload your spine and cover images with the menu on the left, in only seconds you will see your finished image on your screen. Amazing, isn't it? Try another Book Mockup here! 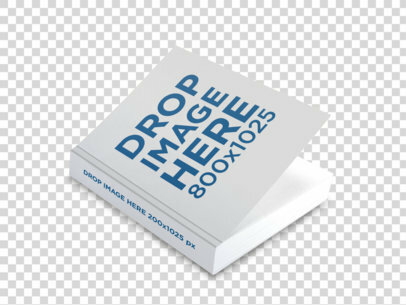 Start showcasing your latest book with this mockup of a hardback book falling on a flat surface, it's a gorgeous visual that'll help you make your revenue grow! 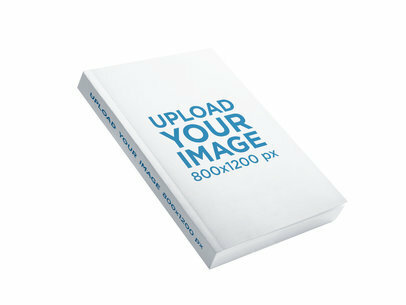 You just have to upload your book cover image with the menu on the left, don't forget to upload the spine! Try another Book Mockup here! Start promoting your latest book in a beautiful way with Placeit, use this mockup of a thick paperback book standing on a transparent surface and make your income grow! You just have to use the menu on the left side of this page to merge your images with the book. After a couple of seconds you will be able to see the changes that you make. Amazing, right? Try another Book Mockup here! Start showcasing your latest book's cover and spine with Placeit's mockups! This one features a paperback angled book floating on a transparent room, isn't it a cool picture? Use it to showcase your latest book in a versatile way, you just have to use the menu on the left side of the page to upload your spine and cover image, we will merge them for you in just seconds. Try another Book Mockup here! Check out this awesome mockup of an angled floating big paperback book over a transparent surface, isn't it a cool picture? Start using it to promote your latest book and make your income grow! All you have to do is use the menu on the left side of the page to upload your images! You can put an image on the spine and another one on the cover, how great is that? Use Placeit and make your income grow! Try another Book Mockup here! Need to check if your book title is original? Try our free book title checker. 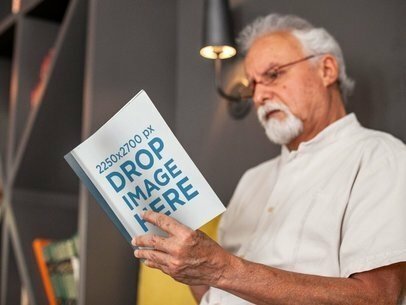 Check out this awesome mockup of a big book lying on a flat surface, it's a gorgeous visual that'll help you build a much stronger image marketing! Start using it to showcase your latest book to your audience, you can upload a spine image and a cover image with the menu on the left part of this page. Awesome, right? Try another Book Mockup here! Looking for Proofreading Specialists? We made a list with the best ones! Take a look at this awesome mockup of a slightly bent paperback book angled on a transparent surface, it's a beautiful visual that'll help you sell your book in a beautiful and versatile way. 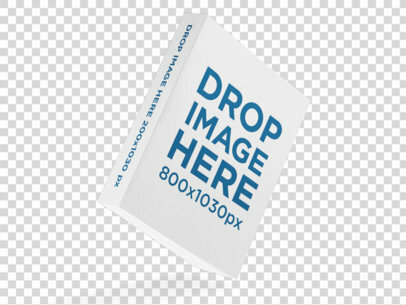 Start putting your own book cover with this mockup from Placeit, use the menu on the left side of the page to upload a spine image and a cover image. Use Placeit and make your revenue grow! Try another Book Mockup here! 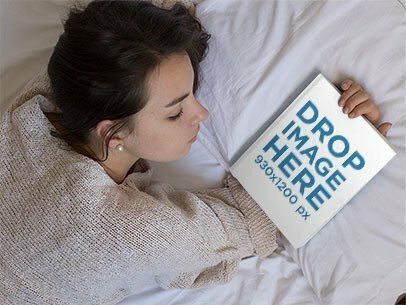 Take a look at this beautiful mockup of a hard-cover book opening while lying on a transparent surface, it's a beautiful image that you can use to showcase your latest book cover. You can upload a spine image and a cover image in the same template, just use the menu on the left! Start using Placeit and make your revenue grow. Try another Book Mockup here! Check out this awesome mockup of an angled textured hardback book against a transparent backdrop, it's a gorgeous visual that'll help you build a much stronger image marketing! Start now using Placeit and see how your revenue grows! Put an image on the spine and another one for the cover, use the menu on the left side of the page. After a couple of seconds you'll be amazed by the results. Try another Book Mockup here! 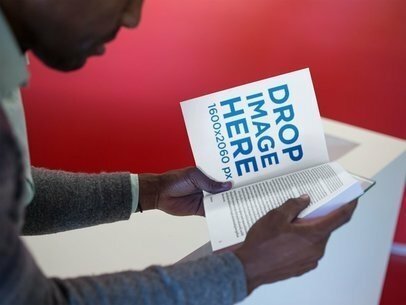 Promote your latest book using Placeit's beautiful mockups, this one features a big book standing on a transparent surface. All you have to do is upload an image for the spine with the menu on the left and an image for the cover with the menu on the right, after a few seconds you will see the finished image. How great is this? Try another Book Mockup here! 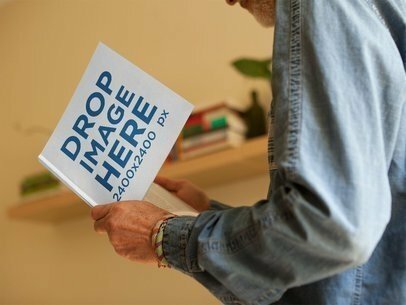 Use this amazing book mockup of a guy holding a paperback book to showcase your latest art for a book cover and surprise all of your followers. Create compelling visual assets with this easy to use mockup generator by Placeit, all you need to do is drag and drop your image over the mockup template and you'll have a mockup ready in no time. 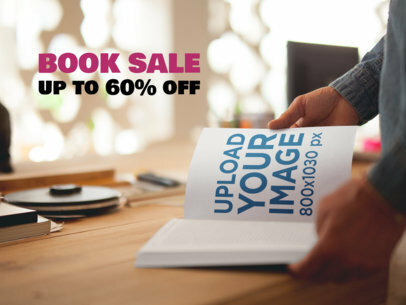 Try out more book mockups to build your own ebook marketing campaign! To see another Book Mockup click here! 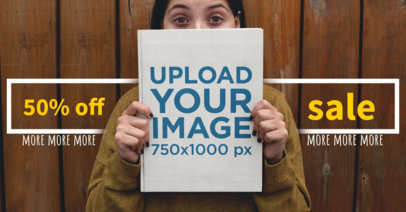 Don't forget to check out this incredible Ebook Mockups Guide! Create book covers with great E-book mockups by simply dragging and dropping an image of your choice onto the template and within no time, start enjoying original visual content ready to be used as part of your visual marketing campaign! Make the most out of your book with Placeit! 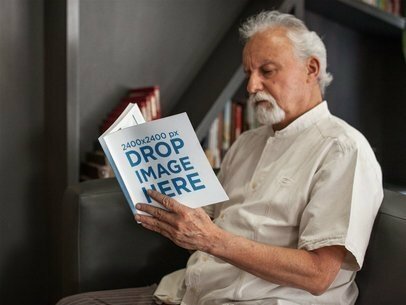 Reach a wider audience by showcasing your book on realistic environments with beautiful images, such as this mockup. This template features a pretty woman holding a book and a basket while at the grocery store, she's buying organic fruits and vegetables only. 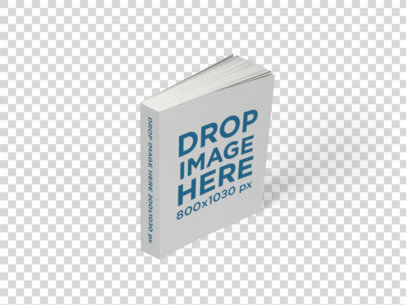 All you have to do to merge your book cover with this mockup is drag-and-drop your image design on the interface, it will be merged immediately. Try another Book Mockup here! 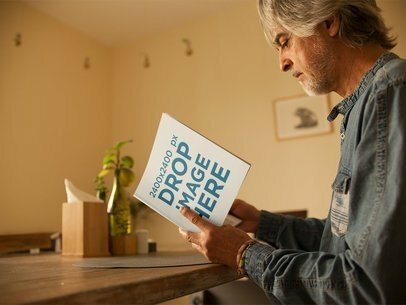 Have a glance at this awesome template of a man reading a square book while indoors, it's a gorgeous visual that'll help you construct an improved version of your image marketing! Sell your book using Placeit's visuals, all you have to do is drag-and-drop an image file on the interface. Sit back for a few seconds and voilá, merged! Try another Book Mockup here! Looking for the best editing software? We made a blog post on that! Check out this awesome mockup of a black man reading a book while sitting down inside a red room, it's a gorgeous visual that'll help you build a much better image marketing. All you have to do is drag-and-drop an image file on the interface, we will merge it for you in just seconds. Start using Placeit and make your income grow! Try another Book Mockup here! 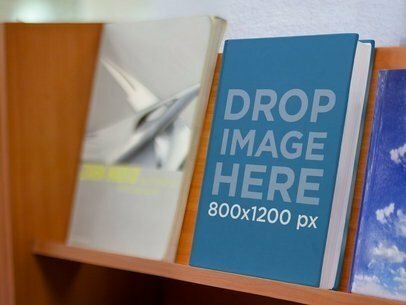 Start showcasing your latest book with Placeit's mockups! We have all kinds of different environments and visual options that will help you make a real engagement with your customers. 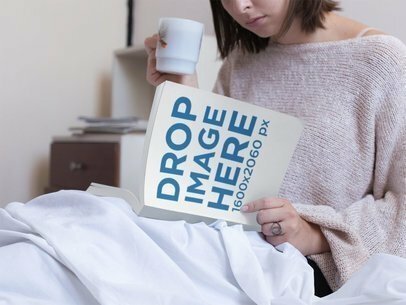 Love comes through the eyes, this mockup of a young woman reading a book while drinking a tea in her bed is a great option for you to display your latest book cover. Just drag and drop your jpeg or png file on the interface, we will process it for you in just seconds! Try another Book Mockup here! Check out this awesome template of an elder man reading a square book while sitting down on his table in the morning. It's a really good visual asset that you can use to showcase your latest book, it'll be displayed through a beautiful and casual image. 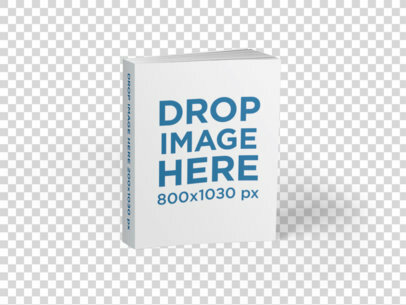 Drag-and-drop your book cover image file on the interface, we will merge it for you in just seconds! Try another Book Mockup here! Start promoting your latest designs with Placeit's beautiful visual assets. All you have to do is drag-and-drop your image file on the interface, we will process it for you in just seconds. Start now! Use this mockup of an elder man reading a book while sitting down on a yellow sofa and make your income grow! Placeit has tons of different mockups for you to promote your latest book. Try another Book Mockup here! 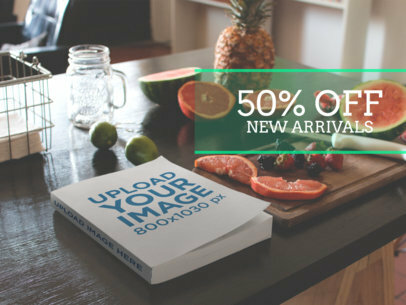 Start promoting your latest book using beautiful mockups from Placeit! Showcasing a real-life environment, they'll help you build a deeper connection with your customers, increasing your sales. 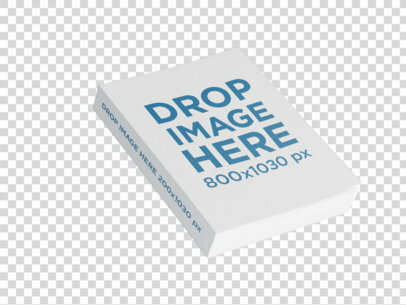 All you have to do is drag-and-drop your book cover image on the interface, we will process it for you in just seconds! It's that simple. Start now and make your revenue grow. Try another Book Mockup here! 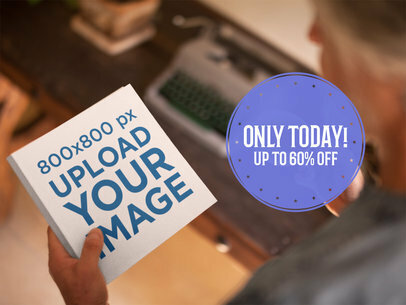 Start showcasing your designs using Placeit's beautiful image assets and boost your sales now! 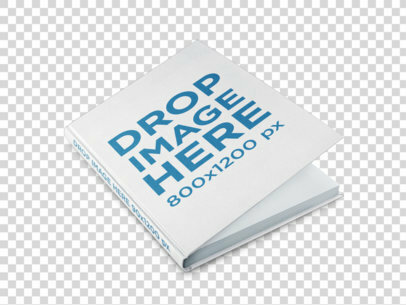 All you need to do is drag-and-drop your book cover image on the interface, we will merge it for you in just seconds. 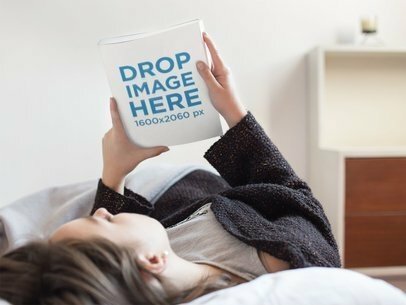 This template features a young girl looking at a book cover while lying on her bed, it's excellent to display your latest book! Make your income grow with Placeit. Try another Book Mockup here! 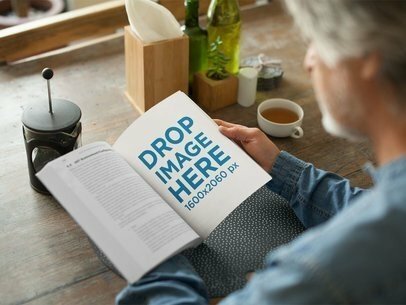 Check out this template of an elder man reading a book and drinking some coffee in the morning, it's a great option for you to showcase your latest book content or design! Photorealistic visual assets will make your customers love you, all you need to do is drag n' drop your image file on the interface. Sit back for a couple of seconds while we merge the image for you. Use Placeit and get more sales! Try another Book Mockup here!